Hostal Absolut Centro is set in a restored building in Barcelona’s Eixample district, near Barcelona University. It offers air-conditioned rooms with a TV and free WiFi access. 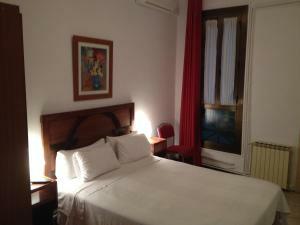 This value guest house is within a 15-minute walk of the famous Ramblas and the Gaudi buildings of Passeig de Gracia. Plaça Universitat Metro Station is just 600 metres away, and the airport bus also stops nearby. Rooms at Hostal Absolut are functional and bright. They have central heating and some rooms have a small balcony. Rooms with private or shared bathrooms are available. Hostal Absolut Centro does not have a 24-hour reception. Guests are kindly requested to inform the property of their estimated time of arrival. This can be noted in the Special Requests box during booking or by contacting the property using the contact details found on the booking confirmation. Please note that there is a € 40 charge for late check-in starting from 22:00. Please inform Hostal Absolut Stay in advance of your expected arrival time. You can use the Special Requests box when booking, or contact the property directly with the contact details provided in your confirmation. A damage deposit of € 100 is required on arrival. This will be collected by credit card. You should be reimbursed within 7 days of check-out. Your deposit will be refunded in full via credit card, subject to an inspection of the property. This functional, bright room has central heating and a private bathroom. This functional, bright room has central heating and offers access to a shared bathroom. Rate: € 59.00 ... € 79.00; select dates below to get current rates.